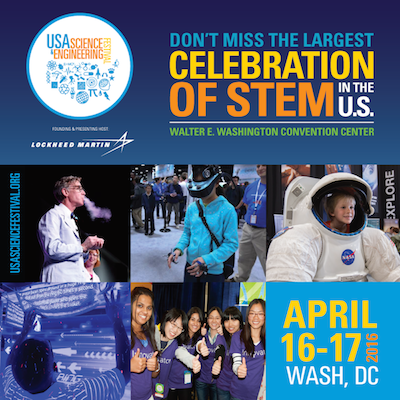 The National Law Enforcement Museum is proud to be an Official Partner of the 4th USA Science & Engineering Festival, to be held April 16-17, 2016 at the Walter E. Washington Convention Center in Washington, DC. What is the universe made of? Why did dinosaurs go extinct? What do magic tricks and hip-hop have to with math? What will be the next medical breakthrough? What does baseball have to do with physics? Find out at the 4th USA Science & Engineering Festival Expo where more than 350,000 K-12 students and parents, over 5,000 teachers and over 3,000 STEM professionals will experience the largest celebration of STEM! Participants include more than 1,000 of the world's leading professional scientific and engineering societies, universities, government agencies, high tech corporations and STEM outreach and community organizations. The two-day Expo is perfect for teens, children and their families, and anyone with a curious mind who is looking for a weekend of fun and discovery. Meet science celebrities like Grammy Award-winning alternative music band "They Might Be Giants!" and Bill Nye the Science Guy! For more information visit www.usasciencefestival.org.